According to emails reviewed by the Wall Street Journal, the technology could help patients find care centers near them and share medical test results. When Apple launched Apple Health Records, a feature that lets users upload their health records from participating health systems onto their phone, in the spring, it sparked conversations about consumers’ access to health records and the entrance of major tech companies into the healthcare space. Now the Department of Veterans Affairs is in talks with the Silicon Valley tech giant about the creation of a portable EHR specifically for veterans, the Wall Street Journal reports. According to the WSJ, who reviewed emails and spoke with unnamed sources about the initiative, what’s currently on the table is a new Apple software that would let the VA patients enrolled in the system transfer their records to their iPhone — a functionality that would likely be achieved via a version of Apple's Health Records app. According to the emails obtained by the news outlet, the talks involved Dr. Bruce Moskowitz, who is not a government employee but rather an acquaintance of President Donald Trump’s through the Mar-a-Lago resort. Moskowitz, a primary care doctor in Florida, was previously included Trump’s meeting with a small group of healthcare executives, according to STAT News. His emails discuss prioritizing tools that let veterans find nearby services via geotagging and the ability to share results and track prescriptions. In the emails he also alluded to making the technology for active duty military personal as well. Interoperability has been a long time issue in the United States. In 2009, President Barack Obama kicked off a program to incentivize providers that went to electronic records. While the adoption rate of EHRs by American providers skyrocketed during this time period — from only 9 percent of hospitals having the systems to 80 percent in 2013 — in the rush to create these systems, hospitals went to different EHR vendors, and those vendors didn't take the time to come to a consensus about storing and sharing data in standardized ways. Webinar: The EHR App Store Is Open - What Is on the Shelf? The VA itself has also undergone changes in its EHR system. Originally the organization used its own self developed system called VistA. But when the DoD announced it was going to move to Cerner’s EHR system, called MHS GENESIS, the pressure was on for the VA to follow suit. Eventually in January 2017 former VA Secretary of Veterans Affairs Dr. David Shulkin, announced the VA would be moving to the new system, citing the need to modernize. If a system like Apple Health Records were to be implemented it would put more control into patients hands and possibly enable better health record transfers. Apple has been continuously making its way into the healthcare space for sometime. Most recently, the company announced an FDA clearance for both an atrial fibrillation-detecting algorithm and an ECG that will be built into the company’s Series 4 Apple Watch. 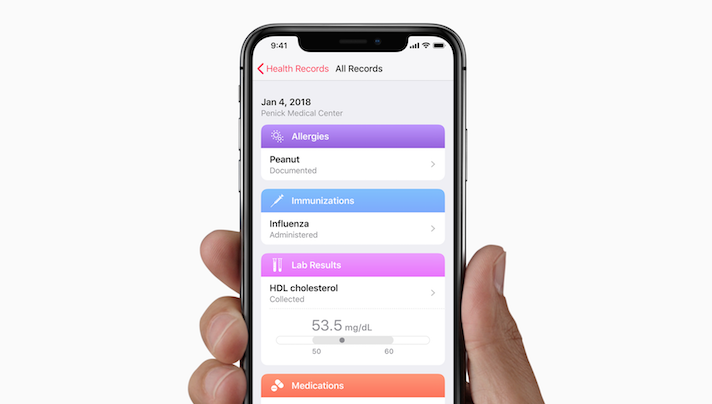 The company has also been expanding its Apple Health records feature with more and more providers opting in ever since it launched back in March. In fact, the VA’s EHR provider Cerner has been working with Apple on this feature. In general across the industry there has been a focus on the consumer gaining more control of his or her data. But many are turning to the consumer world to figure out ways to address this. “I think that healthcare can learn from the consumer world the importance of placing the consumer first and a preoccupation with the consumer experience and their needs,” Naomi Fried, founder and CEO of Health Innovation Strategies, told MobiHealthNews in September.